I was fortunate to have been cast in a walk-on role in one of the largest pieces of theater ever to occur in Cuba while on a recent cultural exchange tour. I was not in a cast of thousands but in a cast of over one million. My role called on me to fly nonstop from LAX to Havana a few days before the performance. On Wednesday, June 10th we had a 5:00 a.m. call on the Málecon. The Málecon is a four-lane boulevard along the ocean in Havana. The Master Director, who has been doing this for over 45 years, was Fidel. He is so good at this he can organize a march with over 1 million people in just a few days. His cast was mostly red-shirted Cubans but he was able to throw in a few visiting North Americans. I was one of those. 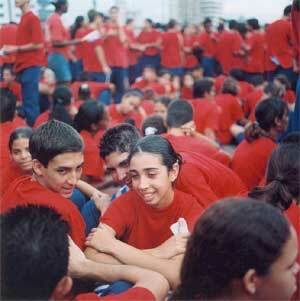 Our cultural exchange tour group had planned to visit Pro-Danza, the Cuban ballet school the day of the march. All our activities for Wednesday, June 10 were canceled due to the march. Our change of plans now called for us to set our travel alarms for 4:00 a.m. so we could arrive at the staging area for the march by 5:00 a.m. I like to walk in the morning anyway so how could I turn down Fidel’s invitation to take a walk by the sea with over one million of my close personal Cuban friends. I didn’t know the purpose of the march and I’m still a little in the dark, just like I was on that morning of the march when I watched the streets fill up with red-shirted youths as the sky over the Caribbean Sea to the north went from pitch black to indigo to rose to white, mirroring the colors of the faces in the crowd surrounding me. Despite the embargo Bush seems to be leaving the door open to continued cultural exchange just by not mentioning it. It is legal for Americans to travel to Cuba but only under certain conditions. Jump through the correct hoops and you are there. The purpose of the trip can’t be vacationing or sightseeing, it must be some form of cultural or humanitarian venture. Most Cubans I talked with matter-of-factly stated that President Bush is maintaining the embargo to appease the anti-Castro Cuban-Americans in Florida who will then help reelect his brother. It seems that the Cuban Diaspora is the tail that wags the alligator. The alligator is the animal representing Cuba due to the shape of the island. The embargo is just one more of the moves in the big chess game. There are many games being played out simultaneously. It became apparent that sometimes Bush is hiding behind the terrorism game. There are schemes on both sides the likes of which we have not seen in quite a while. Conditions change daily and policy is not frozen. It is all being carefully thought out but as minds change policy is in motion. On Monday and Tuesday we started asking people we met if they would be going to the march. One cab driver said, of course he was going. “Es mi pais.” “It’s my country.” An old woman outside of town talked to us over the wall in her front yard as the TV inside announced the march. She said she and her son would be picked up and taken to the march. The planning, preparation and execution of this massive march was slowly revealing itself to us. Late Monday afternoon we began to see crews setting up temporary yellow metal scaffolding for large banks of rock concert size speaker cabinets or rows of speaker horns and stringing wires down the Málecon. Amplifiers and mixing boards began to appear at regular intervals. Our group’s plan was to arrive at the Málecon at 5:00 a.m. and obtain a good position near the front of the march. We thought there might be speeches there so we tried to get as close to the stage next to the Málecon as possible. That was the area where any possible Fidel sighting would occur. At 5:00 a.m. the streets were swarming with orderly groups of red-shirted students. Class-sized groups of 30 to 40 were moving to take their positions near the front of the march. Adults were further back and one block to our left stood rows of older men in their revolutionary uniforms, many with campaign ribbons covering their chests. Four by eight inch plastic Cuban flags glued to one-foot sticks were being passed out from large paper bags. They were everywhere and there were plenty to go around. All the marchers had the small flags to wave and here and there were groups with large flags on poles that carried them above the heads of the crowd. Cuban flags predominated but there were also flags from Brazil, Mexico and other hemispheric neighbors. Most dramatic were the red and black flags of the revolution. Punctuating the dark sky were poles wrapped in blue and white with smaller flags attached to their tops. Rumba music had begun playing on the speakers outside our hotel window starting at 5 a.m. That music continued to play intermittently from all the speakers until the march began at 8 a.m. Rows of policemen with black berets lined the marchers on the left, to the right was a wide sidewalk with a low seawall between us and the dark Caribbean to the north. The police wore no guns. The marchers, for the most part, stayed on the pavement. At one time I was standing on the curb when a policeman gently touched my elbow and guided me a few steps onto the street as if he were a maitre ‘d escorting me to my table. The beginning sections of the march seemed to be made up of the younger students. Some sat resting with their heads on their knees while others with more energy chanted and waved their small flags. Most carried nothing. No water bottles, no backpacks, no snacks, no books and no toys. I saw only one student with a camera. A very light rain fell at about the same interval as the music and eventually stopped altogether. The concrete floor of the audience area in front of the stage to our left was kept clear. Arches of metal tubing held lights that made the area look like an empty soccer field at night. The stage was where we falsely assumed that Fidel might speak. Now only a small group of upper elementary students began to line up on the stage. The American eagle that once stood atop the two Doric columns is now gone, victim of a previous revolution. The headless stone eagle now rests in a secluded room in one of the museums. The chess game that is U.S.-Cuban relations has a checkered past, present and future. A deep indigo dawn light began to emerge over the ocean between huge tropical clouds above the rows of red-shirted students. Several small groups near us were visiting medical students from Honduras, Brazil, Argentina, El Salvador and Africa. They were selected in their own countries and were studying medicine for free in Cuba. These medical students must also study music, art and dance to make them well-rounded people. Quotes from Fidel came from the loudspeakers with the message that, “We wont fight with arms any more. From here on the war will be one of ideas, not arms.” A student near us was surprised to hear from us that not everyone in the U.S. wants to resort to arms to solve conflicts. A microbiology student I sat next to said, “This is a miracle” when I told him I was a North American. He and his father had awakened at 3 a.m. and walked to the march as no busses or cabs were running in Havana that morning. I had to be careful to always refer to myself as a North American and not just an American. In the bars and in the taxis over the previous days all attention was focused on the World Cup soccer games. The Cubans really wanted a team from our hemisphere, the Americas, to win. They didn’t care if it was Mexico or Brazil or the United States just as long as it was one of our neighbors. We all rooted for one of the American teams. The voice of Pablo Miranes sang a ballad over the marchers, creating a restful but expectant mood. Rumba music played after a period of silence. Our small group sat on the sea wall in the growing light and watched a small powerboat cruise near shore and drop three men in masks, wet suits, flippers and snorkels into the water. They began free diving near the shore. It was like a scene out of a James Bond movie but the mystery was that it was just what it appeared to be. A woman with a paper credential pinned to her shirt asked us to rejoin the marchers in the street. The crowd was now so thick we could barely move through it. It was like one last person entering an overcrowded elevator. There was a fatalistic calm among the marchers, as everyone knew that they would be standing in this intimate situation for three hours before moving. Thirty-story apartment buildings rose above us but no residents crowded the balconies. Everyone was on the streets. A few soldiers observed the crowd from the tops of buildings nearby. At 7:30 the crowd suddenly surged forward. It was an easy, orderly flow but the suddenness of it caught me up like a leaf being swept along by a gentle stream. A helicopter flew by with a TV camera sticking out its window and a sea of small fluttering Cuban flags swelled up and crested and moved back through the marchers, following the camera in the helicopter. We moved forward in short bursts three times like this until we were within 100 rows of a brass band at the front of the march. Three silver bells of Sousaphones poked halfway above the field of red shirts and flags. All around us were boys and girls in their late teens in bright red shirts and dark blue pants, white socks and black shoes. Outlining the sea of red was a thin line of gray and blue uniforms punctuated with black berets. The line of berets broke up occasionally into small clumps of casual conversation. A small group of photographers with khaki vests and long lenses poked at the crowd from a vantage point on a low wall. At 7:55 the young students on the stage began to regroup as the national anthem was played. The ranks of old soldiers stood at attention and saluted. The marchers continued to stand and quietly converse, the deep buzz of a million voices. There was a flurry of flag waving as the helicopter flew by again. The three silver Sousaphone bells suddenly faced the stage at attention and what I thought to be a woman’s voice came over the loudspeakers. We surged forward another ten feet and then stopped and then surged again and once again. We surged past the statue of the pointing man holding Elian. As we surged past the stage I could see that it was not the voice of a woman over the loudspeakers but that of a young boy. I’m sure he had won a contest for best oration in his age group. He was delivering a fiery oration in the style of a child evangelist. He was preaching to the choir. With my limited Spanish I could only understand small portions of his speech. The words I responded to were, “Abajo con las mentiras.” “Down With the Lies.” I could only agree and wave my tiny flag. Before the march we asked several Cubans if they thought we would be in any danger on the march. The response was always that the Cubans loved the American people. It was the policies of the U.S. government that they disliked. The Cubans could not understand what right the Bush administration had to tell them how to live. The final lurch at exactly 8 a.m. turned out to be the opening of the floodgate and we began our march down the Málecon past the stage, past the American Interests Section, past CNN cameras and on down the wide boulevard between the sea and the city. A Japanese film crew set up on the sidewalk. A Cuban journalist asked what I thought about the 5 Cubans being detained in a Florida jail. When I said I had just heard about it that morning and had no opinion he moved on. The short version I heard on the street was that five Cuban secret service agents had entered Florida to infiltrate an anti-Castro Cuban-American terrorist network. These five Cuban antiterrorist operatives were arrested and jailed in Miami. Their defense tried to obtain a change of venue from Miami to Jacksonville where it was thought they would get a less biased jury pool. The judge denied this. The Cuban telling me this story concluded that the Florida justice system was corrupt. I personally don’t think that the Florida justice is any more corrupt than the Cuban justice system. It must be very confusing for the Bush administration to be anti-terrorism on a global scale, pro anti-Castro and at the same time be anti-anti-anti-Castro. It’s not easy being leader of the Free World. 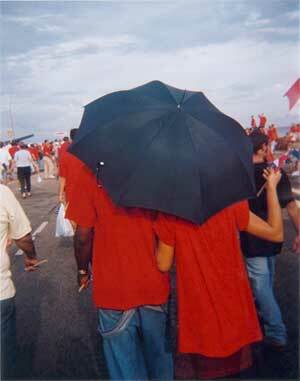 Another T-shirt I saw said, “Cese el Terrorismo Contra Cuba!” I continued to march. Amazingly, our small group within a million never became separated from each other. We gathered to the side of the march on the seawall to rest and reload our cameras and watched the march. What motivated the marchers? The joy of being part of a larger community? The party atmosphere? Duty to country or fear of reprisal for non-participation? The flow of red shirts could be viewed as a healthy surge of red blood cells through the body or as millions of pounds of red flesh being ground up into communist sausage and spit out into the streets of Havana. The march route suddenly turned left and up the gentle slope of Ave. De los Presidentes. Our immediate goal was the lobby of the Hotel El Presidente, a 14-story oasis of opulence and luxury. Our ragged, hungry, sweaty, tired, coffee-deprived group entered the posh lobby and was directed to the $10.00 breakfast buffet. We went from marching with the people in the streets to gorging in a tourist palace where breakfast cost the equivalent of one month’s salary for a Cuban doctor. It sure was tasty. It was just one of the many examples of extreme contrasts that we experienced all week. At 10 a.m. the line of marchers was still passing by under the windows of our tile-floored sunroom eating area. We took the elevator to the 10th floor and found the stairs that led to the roof. We looked out over the marchers and could not see the end. After five minutes of photographing and exploring, two unarmed soldiers ushered us back down the stairs. We toured the lobby and viewed the treasures on display. Nat King Cole and Josephine Baker photos told that they were among the famous people who had played the hotel. We washed up in the hotel restroom and rejoined the march at 10:30. We continued up Ave. de los Presidentes past statues of previous leaders of Cuba. Busses and stake bed trucks were lining up and loading up with groups of marchers being taken back to their homes in neighborhoods outside Havana. Those who lived in the city continued to walk. After standing for more than two hours in the predawn and then marching for over two hours the Cubans now had to stand packed into the backs of trucks and wait for traffic to clear. We walked past one truck parked on a side street waiting to enter the avenue. The passengers standing in the back smiled down on us as we took their photograph. Then the truck refused to start. The drivers got out and popped the hood. Four in our group began to circle the truck and photograph one driver handing large open-end wrenches up to his partner in a red jump suit. The driver smiled at us and at the irony of the situation. The marchers standing in the back of the truck began to laugh at us as we surrounded the stalled truck, shooting from every angle. Soon everybody was laughing in a great display of American/Cuban human solidarity. As we continued up the wide avenue we encountered a large tank truck dispensing water to the crowd. The spigots on the side and rear were open and flowing freely. Sweaty marchers filled water bottles and children stuck their heads under the water and let the stream flow into their mouths. We walked past truck after truck packed with marchers on their way home. Some were waiting quietly with tired faces and feet but many were continuing to wave at us and revel in the continuing excitement of being part of such a huge gathering of humanity. As we reached the top of the rise we arrived back at La Rampa, the main thoroughfare that led to our hotel a few blocks away. The porta-potty situation finally revealed itself to me. I had been wondering for hours just how the march organizers would be able to gather a million people with no food, water or facilities. I had skipped breakfast when I awoke at 4:00, avoided coffee and sipped sparingly on my water bottle to avoid filling my bladder. Lines were forming outside two sheet metal structures placed over the storm drains in the gutters. One side was marked El and the other Ella. The most intrepid member of our group waited in line just to see what was inside. There was nothing. Just the metal walls to shield the user who stood or squatted over the metal grate of the hole in the pavement that drained to the nearby Florida Straits. I only saw four of these units on the route I walked. Leaving the marchers behind we reentered the commercial area leading to our hotel. Towers of speakers continued to fill the streets with music and messages. Vans began to load up the sound equipment as the event began to wrap up. A hundred or so of the small Cuban flags were scattered under one streetlight pole. Now that I am back in the U.S. with Internet access, my reference library and home delivery of newspapers and magazines I have a little clearer perspective on the march. Carter’s visit to Cuba brought attention to the Varela Project, a petition that was circulated in Cuba calling for increased democracy. Fidel called on all loyal Cubans to take to the streets to support a new amendment to the constitution declaring his political, social and economic system “untouchable.” I’m sure that Fidel and the Cuban government will be circulating their own petition in support of the status quo. One artist I talked with told me that unless he signed the government’s petition he could face the prospect of losing his stall where he sells his art. He really knows that there’s no art without suffering. I’ll be combing the newspapers and magazines and Internet for news of Cuba and our hemisphere. I can’t believe how undereducated I have been about this important topic. I’m motivated by a thirst for knowledge about this complex and fascinating topic. I am also motivated by a thirst for rum drinks. I can hardly wait to return to Havana for more mojitos.